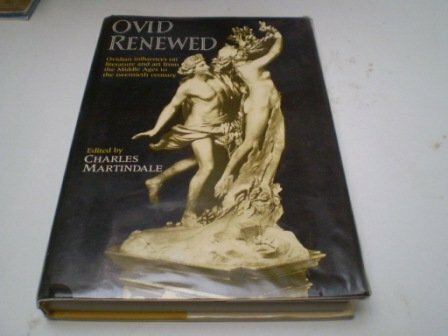 Ovid Renewed: Ovidian Influences on Literature and Art from the Middle Ages to the Twentieth Century. Synopsis: This book is a study of Ovid and his poetry as a cultural phenomenon, conceived in the belief that such a study of tradition also casts fresh light on Ovid himself. Its main concern is with exploring the influence of Ovid on literature, especially English literature, but it also takes a wider perspective, including, for example, the visual arts. The book takes the form of a series of studies by specialists in their fields, including a number of scholars of international renown. The essays cover the period from the twelfth century, when there was an upsurge of interest in Ovid, through to the decline in his fortunes in the nineteenth and twentieth centuries. They are critical and comparative in approach and collectively give a detailed sense of Ovid's importance in Western culture. Topics covered include Ovid's influence on Chaucer, Spenser, Shakespeare and his contemporaries, Dryden, T. S. Eliot, the myths of Daedalus and Icarus and Pygmalion, and the influence of Ovid's poetry on art. Book Description&colon; This book is a study of Ovid and his poetry as a cultural phenomenon, conceived in the belief that such a study of tradition also casts fresh light on Ovid himself. Its main concern is with exploring the influence of Ovid on literature, especially English literature, but it also takes a wider perspective, including, for example, the visual arts.